It seems to be a long time since I've seen a new Max Decals release and this one is certainly worth that long wait. 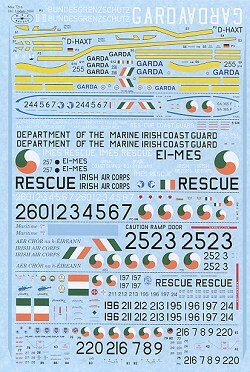 The subject of this sheet is Irish Air Corps Update 2004 and it includes a rather large selection of aircraft. There have been some major changes in Max sheets and the first that I noticed is that the instruction booklet is in full color. While color has been available on their web site, it is nice to see it along with the decals. The second is that they seem to have gotten a new decal printer as I don't recall the blue backing for earlier sheets. The reproduction is first rate with no registration glitches and nice, vibrant colors. Another thing that struck me while going over the subjects is that there are not that many kits out there for these subjects. Some are definitely a bit on the esoteric side, but according to the instructions, there are kits and conversions that can be used for every one of the subjects. 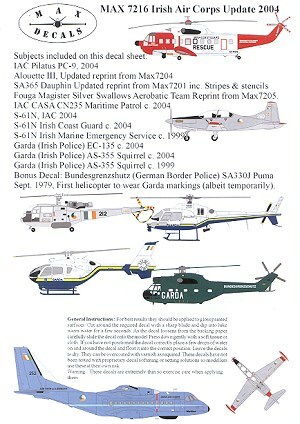 Going by the order of what's on the sheet, the first aircraft are all helicopters of the Irish Police (Garda). In no particular order there is an EC-135, AS 355, and SA 330J (better known as a Puma). Kits for these are Revell for the EC-135, Miku (a resin kit) for the AS 355, and Airfix for the SA 330J (though some mods will be needed). A standard SA 365 Dauphin is the next helo and that can be found in a Matchbox/Revell kit and suitably modified to bring it up to standards. Next is another helicopter, the S-61N. This can be done in either Irish Air Corps, Coast Guard or Department of the Marine. Colors for all three options are the same and there is no dedicated kit. In this case, one uses an Airfix kit with the Transport Wings conversion set. We next get to a standard airplane, in this case a Pilatus PC-9M. This is in an overall light grey with red flying surface tips. Aeroclub does a fairly good short run kit of this plane. The biggie on the sheet is the CASA CN 235. This rather large twin engine transport is kitted by Broplan as a vacuform kit. It is really quite nice and would be a good one to start with. Returning to helicopters, are the long-serving Alouette IIIs, for which Heller makes a very nice kit. The final schemes on the sheet are for the equally long service Fouga Magisters. I would have thought these planes withdrawn from service, but they are still the 'hot ticket' in the Irish Air Corps. The best kit is by Heller, but Airfix also does one that should work just fine. A truly great sheet with a little bit of everything on it. You should be able to find several neat schemes to add to your collection. Review sheet courtesy of Max Decals. To see color versions of the sheet instructions, please visit them at www.maxdecals.com. You can also order sheets if they are unavailable at your local hobby shop.